The USBG-7U3ML is a mountable USB 3.0 Hub that complies with the Universal Serial Bus 3.0 (USB 3.0) Specifications Revision 1.0 and provides up to 5Gbps data speed. 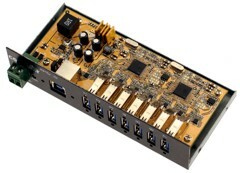 It provides 7 downstream ports with standard Type-A USB 3.0 connectors. 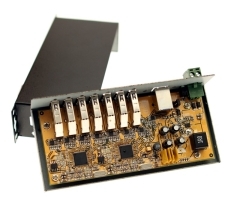 It supports screw lock features for both upstream (USB type B) and downstream (USB type A) connectors with the screw lock USB cables, which prevent accidental disconnection. ** Screw-Lock USB cable & Power supply NOT included.